A year and a half after Nevada virtually shut down its thriving rooftop solar industry, Gov. Brian Sandoval signed a bill last week designed to bring it back. It was among eight clean and high-tech energy bills recently considered by the state legislature. Sandoval also signed laws crafted to install charging stations for electric vehicles and incentivize energy efficiency. But Sandoval also vetoed a widely supported bill that would have increased the state’s requirement for renewable energy in its electricity supply from 25 percent by 2025 to 40 percent by 2030. And he rejected a bill designed to establish community solar projects, where renters and low-income Nevadans could participate in generating solar power. The vetoes did not negate the importance of renewable energy, which is “immensely popular” in Nevada, the Republican governor said. He emphasized that the bills he did sign solidify Nevada’s position as a leader in clean energy. At a signing ceremony last Thursday, he sat at a desk made out of a solar panel at a Tesla warehouse in Las Vegas. “I believe humbly that (the state’s rooftop solar industry) will be a national model across the country. I’m as competitive as it gets and I really want Nevada to truly be a leader in energy policy,” Sandoval said. Nevada Gov. 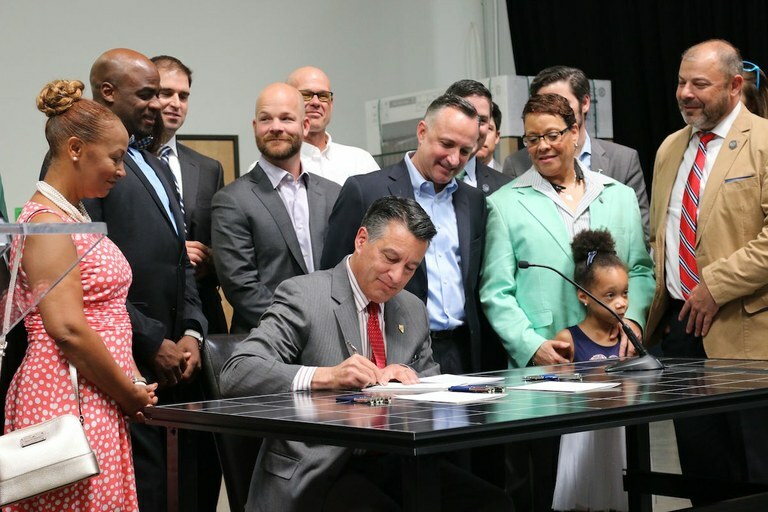 Brian Sandoval signs a bill to bring back the rooftop solar industry. He’s accompanied by state legislators who promoted the bill and owners of solar businesses. The enthusiasm for clean energy laws in Nevada stands in stark contrast to the steady stream of negative news coming out of the Trump administration on clean energy and environmental policy. President Donald Trump has derailed the Obama administration’s Clean Power Plan, which incentivized renewable electricity, and started the process for removing the United States from the international climate change agreement signed in Paris in 2015. That renewable portfolio bill was opposed by some of the most influential forces in Nevada politics – some casinos, the Nevada Resort Association and local chambers of commerce. It passed the legislature with little Republican support. The renewable portfolio standard required a “bigger lift” from utility company NV Energy than the rooftop solar bill, said Brooks, a freshman legislator who has owned and worked for solar companies, because it would have had to significantly increase how much electricity it gets from solar, wind and geothermal sources. Brooks vowed to continue pushing for a more ambitious renewable mandate in the future. Sandoval explained in his veto message that he would have supported the renewable portfolio bill if it weren’t for other major changes underway in the state’s electricity sector. In the next few years, the state likely will shift from a monopoly energy supplier, NV Energy, to providing residents choice in electricity companies. Sandoval also expressed concerns that increasing the renewable energy mandate could have resulted in higher electricity rates. By contrast, the rooftop solar bill passed nearly unanimously. The legislators were responding to intense public backlash after the state’s Public Utility Commission in December 2015 added more fees for new and existing solar customers and greatly reduced their compensation for sending excess electricity to the grid from their solar panels. When fully phased in, the order would have cut those customers’ compensation by 80 percent, making rooftop solar uneconomical. As a result, big solar-leasing companies, like Sunrun and SolarCity, closed their installation businesses in Nevada. Many smaller local businesses shut down too. The state lost an estimated 2,600 solar jobs. The new law is a compromise. Existing solar customers, who were grandfathered in last year after sustained public protest, will continue to get one-to-one compensation for the power they feed the grid. Compensation for new solar customers will start at 95 percent of the retail rate and decrease to 75 percent as rooftop solar grows. This is enough for solar to keep making economic sense, solar-installation companies say. The law also establishes that customers have the legal right to generate electricity, feed it to the grid and store it in batteries, and it prohibits utilities from charging them extra fees for doing these things. “It’s a huge opportunity to reopen Nevada for rooftop solar. It provides the assurances and the consumer protections and net metering rates that create sustainable long-term certainty for customers, Nevadans and solar companies,” said Alex McDonough, vice president for policy at Sunrun, a large solar panel-leasing company based in San Francisco. Sunrun, Tesla (which purchased SolarCity) and other companies already are hiring new staff, sending solar panels to warehouses and reconnecting with former customers whose plans for home solar panels have been in limbo for a year and a half.